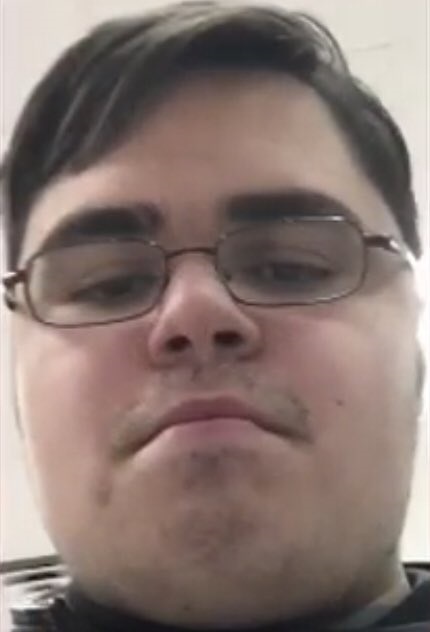 Ethan Jones operates under a number of online aliases. 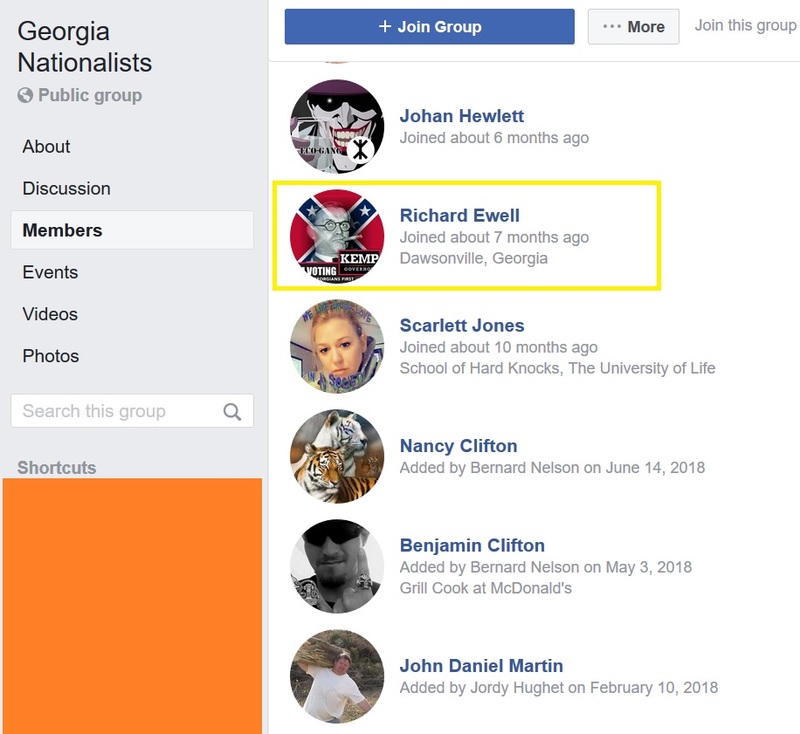 For example, on Facebook he is “Richard Ewell” – a reference to the Confederate general Richard S. Ewell – while on Twitter, Jones is “Georgia Nationalist”/@RichardEwell4. Jones’ accounts on various social media platforms have similar friendship circles, imagery, and propaganda style. Often, Jones uses images of white supremacist politicians for his profile pictures: Eugene Talmadge, a three-term governor of Georgia, is a favorite. We first encountered Jones’ online presence in 2017, when we were looking at the fascist American Vanguard / Vanguard America in our state. 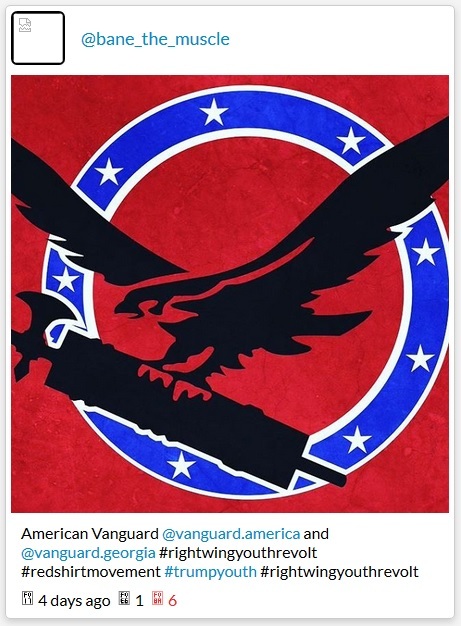 We noticed an Instagram post endorsing Vanguard Georgia (i.e. 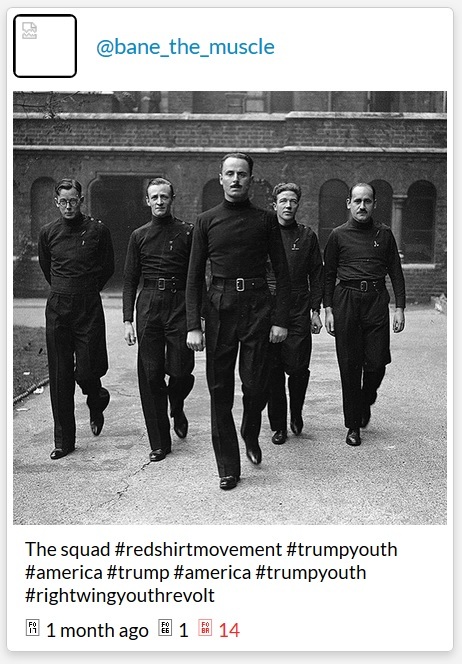 Vanguard America in Georgia) but containing the hashtag #Redshirtmovement. 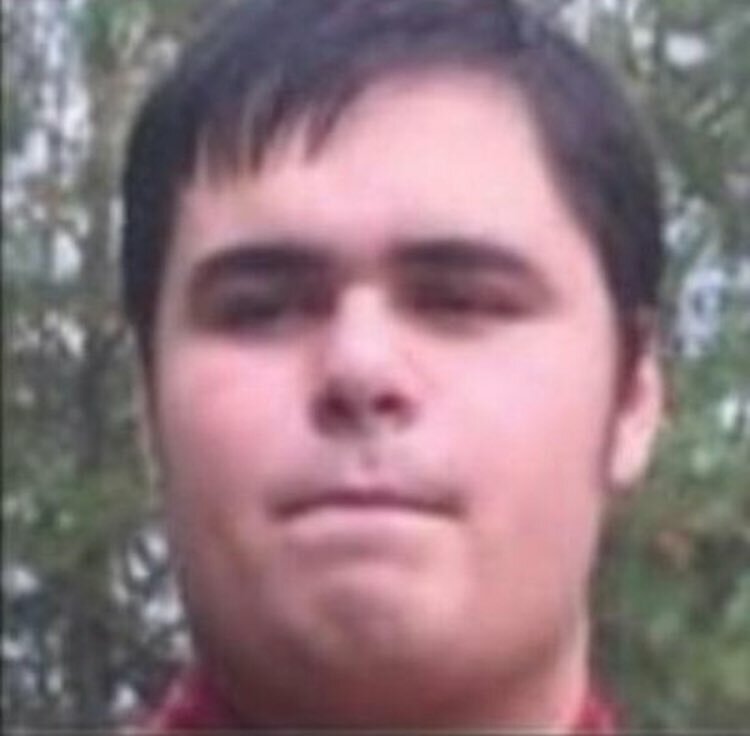 At the time, Ethan Jones was using several Instagram accounts to promote the “Redshirt Movement” and “Georgia Redshirts”. The “Red Shirt” name referred to late-19th Century white supremacist paramilitary groups in the South. 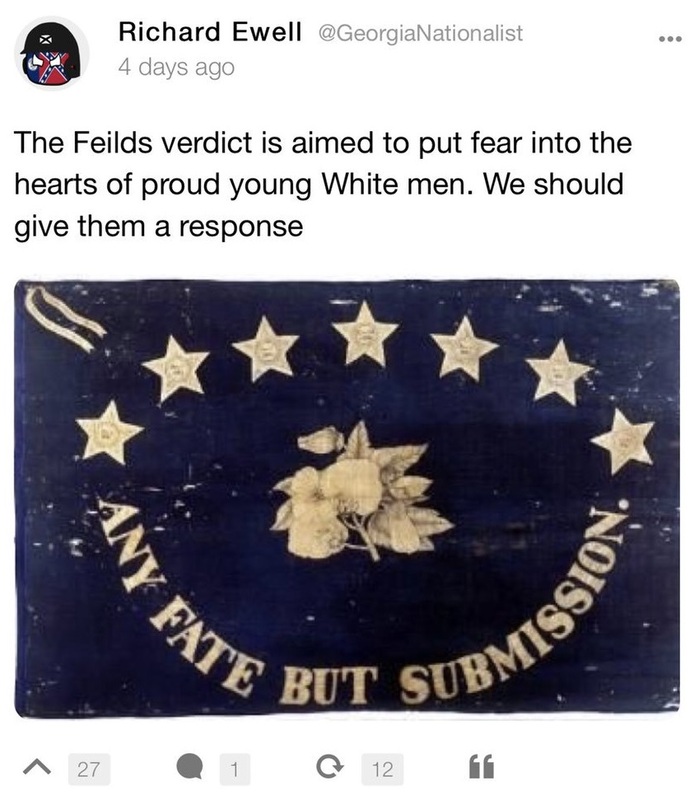 Although there were “Redshirts” Instagram accounts for several states, Jones’ Georgia accounts were particularly energetic, mixing Confederate imagery, posts celebrating Georgia white supremacist politicians, and pictures of 20th Century fascist movements. While Jones was posting “Redshirts” content in 2017, he was not very savvy about what he shared online. Eventually, some of the photos Jones posted of himself on private accounts began circulating more broadly. 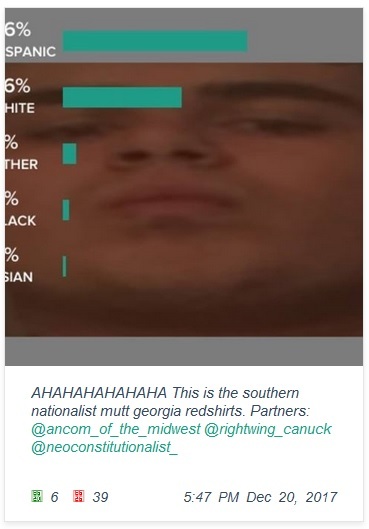 As recently as 2018, Ethan Jones’ “Georgia Nationalist” Twitter account followed a number of Woodland High School (WHS) students, often members of the Class of ’19 – this further supports the identification of “Georgia Nationalist” and related accounts as WHS student Jones. Further, one old Instagram from his cluster of accounts included the phrase “Bartow County Redshirts” in its bio. 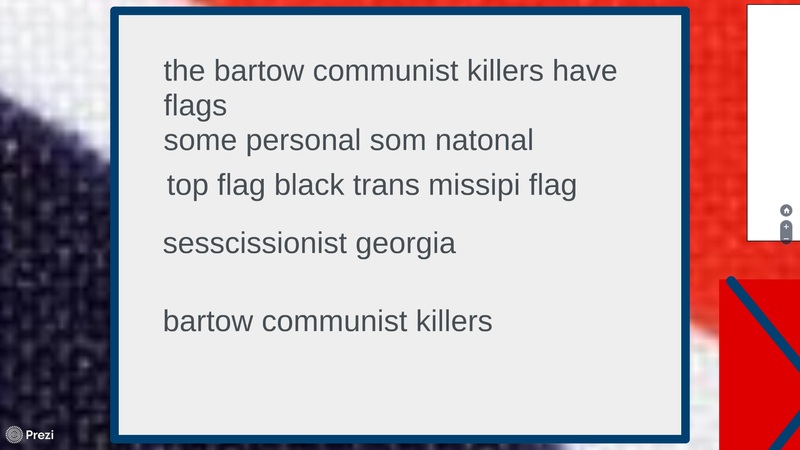 We discovered that years earlier as a young teenager, Ethan Jones had a fantasy life based around an imaginary gang called the Bartow New Confederates, the Bartow Yankee Killers, or the Bartow Communist Killers – this was clearly the same person responsible for “Georgia Redshirts” a few years later. Sadly, Jones is now completely immersed within the white supremacist scene, and his activity can no longer be written off as playacting. 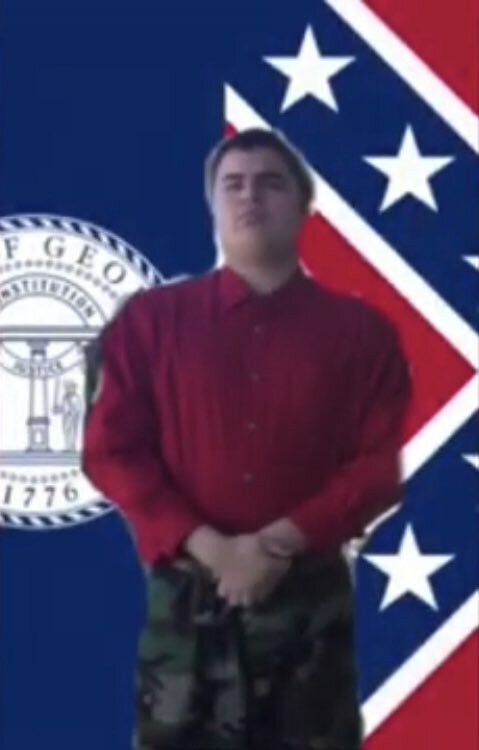 In late 2017 – just as his “Redshirts” period was drawing to a close – Ethan Jones joined the League of the South, a white nationalist and Southern secessionist organization whose ideology is increasingly close to neo-Nazism. Jones joined LOS only a few months after the 2017 “Unite the Right” rally in Charlottesville, Virginia, where the LOS was at the forefront of street violence. It is clear that Jones is impressed by the LOS as a potential fighting force, even though in reality LOS’s capacity has diminished since Unite the Right. 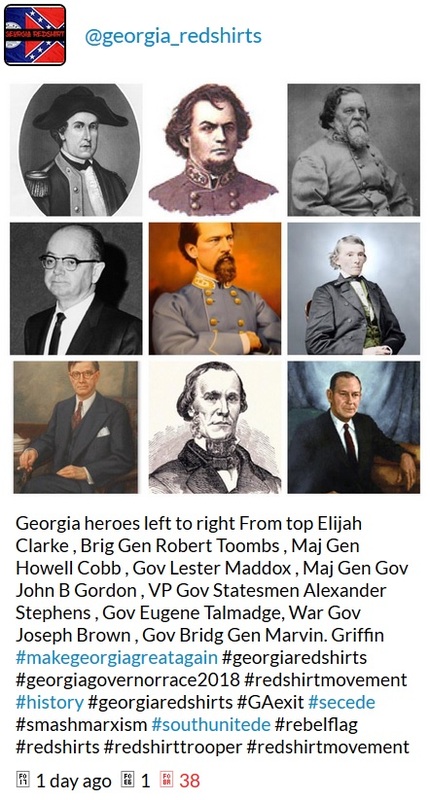 In his April 11, 2019 recruitment article for the League of the South, “Put on the Blackshirt”, Jones celebrated the “gallant men” of the League of the South, who took on the “Communist hordes” in Charlottesville. In an October 2018 post on the Vkontakte social network – written as Jones’ one-year anniversary with the LOS approached – Jones stated that he was “committed to advocate and promote the League and it’s [sic] mission.” The post was accompanied by a photo of graffiti stating: “Be a man among men – League of the South” and including a Southern nationalist Cushman flag. Jones may have left this graffiti in or near Cartersville. 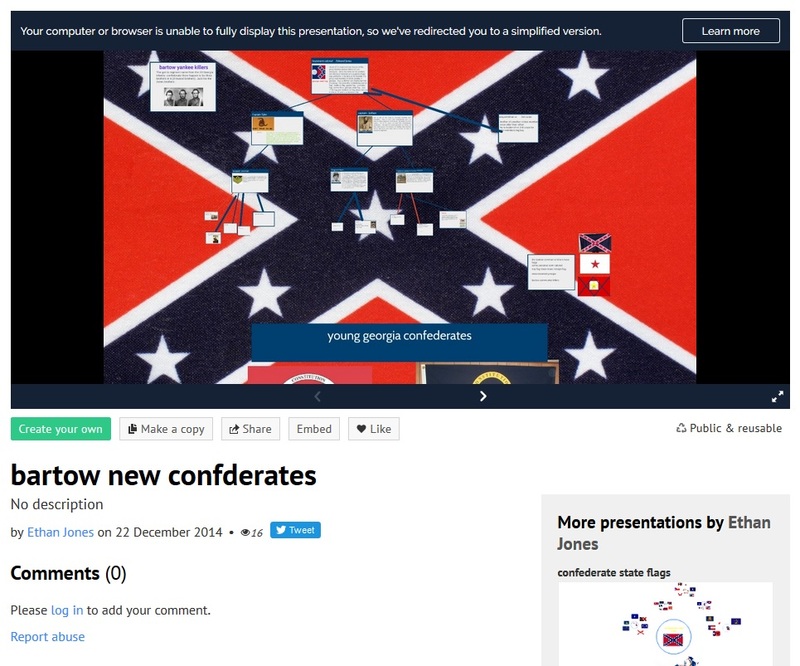 Beyond his LOS membership and social media activity, Jones’ main contribution to the racist movement is submitting articles to two websites that combine Southern secession and white nationalism, “Identity Dixie” and “Southern Revivalism”. Jones began contributing articles to Identity Dixie in March 2018, beginning with a series celebrating Eugene Talmadge. 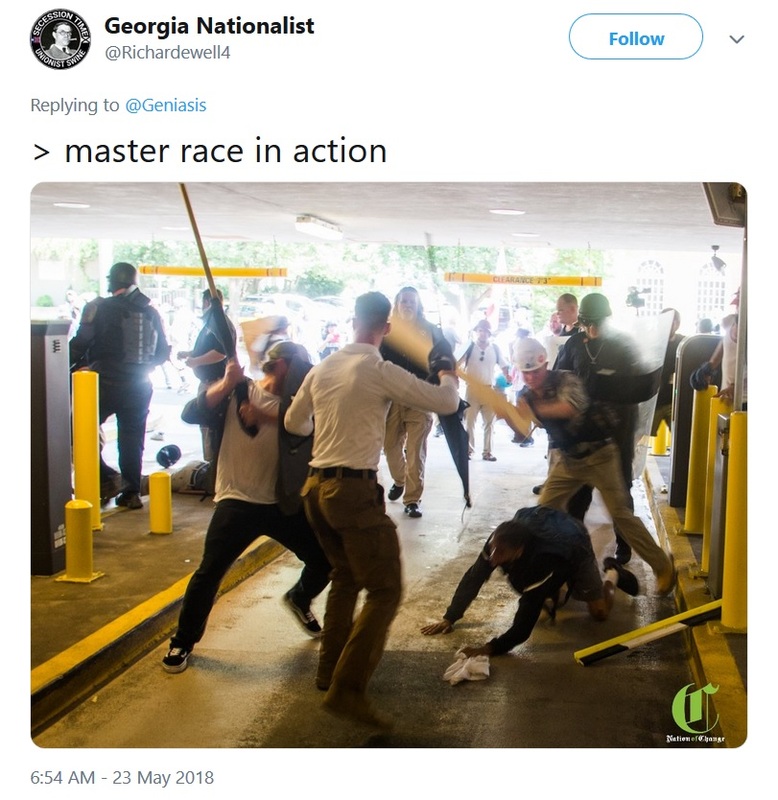 Since then, Jones has been a regular contributor to Identity Dixie, submitting articles on topics such as race-mixing “white harlots” during Spring Break, or lauding the “united Southern resistance to integration.” In one article published by Identity Dixie in August 2018, Jones advocated for a “mass [white nationalist] event at Stone Mountain using only Southern styled optics”, claiming that “Antifa will be much less of a problem due to the anti-mask laws.” A few months later, “Rock Stone Mountain” white supremacists called for a racist rally at Stone Mountain Park outside Atlanta, but their efforts collapsed entirely with the denial of a rally permit by the Park and due to determined anti-racist organizing. It is unclear whether Jones’ article partially inspired the “Rock Stone Mountain II” debacle, or whether Jones was merely putting forward a proposal that had been circulating more broadly in the white nationalist scene. 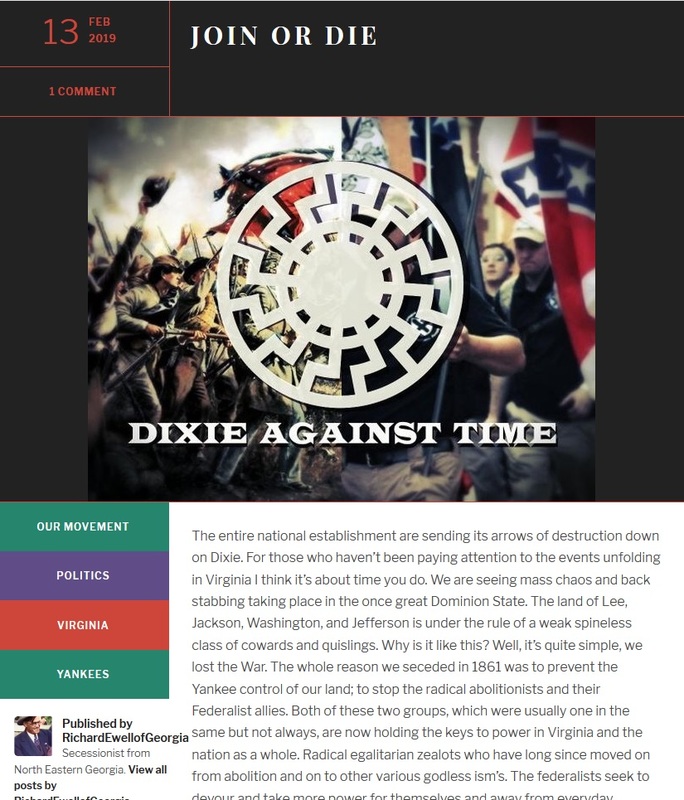 As well as working with the Alt-Right/Southern nationalist “Identity Dixie”, Ethan Jones has contributed over one hundred pieces to “Southern Revivalism”, another racist and Southern secessionist website which launched last year and appears to be run by a friend of Jones’ in North Carolina. In his “Southern Revivalism” articles, Jones offers revisionist histories of the resistance to Civil Rights, endorses Georgia Governor Brian Kemp as an alleged defender of Southern values, encourages readers to join the League of the South, and defends lynching. (You may not want to click on that last link – includes lynching scenes.) In addition, Jones’ articles are drenched in hatred of Jewish people, feminists, and sexually-active unmarried women. 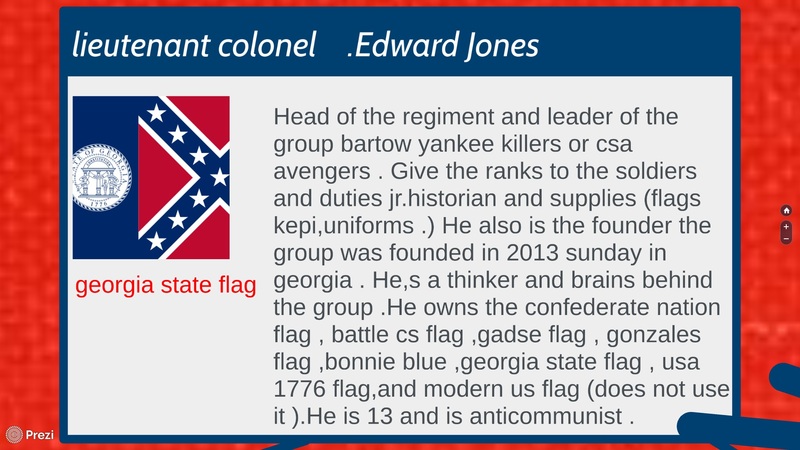 On Facebook, Jones operates a private group named “Georgia Rightwing History”, which likely circulates the same racist revisionist histories as Jones’ articles. 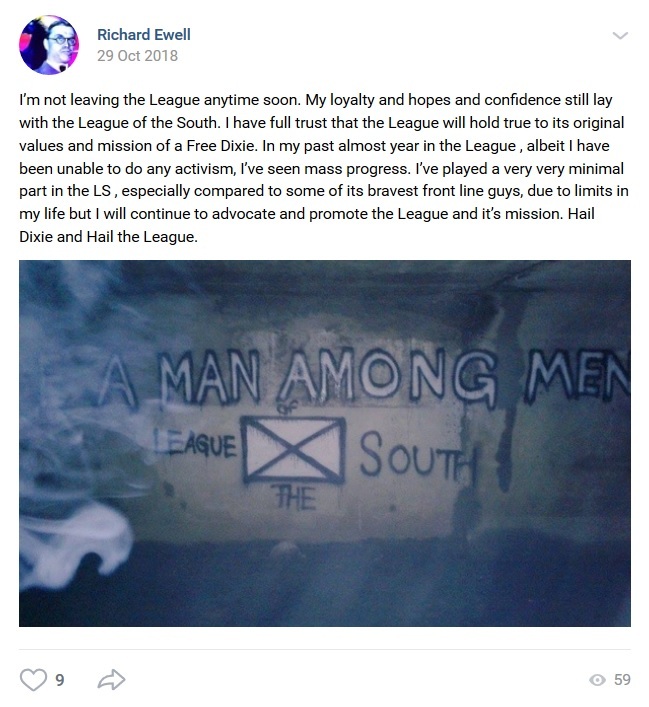 Ewell is also a member of the white nationalist “Georgia Nationalists” Facebook group, which includes former Sacred Knights of the Ku Klux Klan member Susie Wells Smith plus members of the racist Nationalist Liberty Union such as Paul Lovett and John Daniel Martin. Jones’ constant white nationalist and Southern secessionist propaganda, as well as his glorification of racist violence and his membership in the League of the South, should concern those around him. We have mailed two hundred flyers to Jones’ neighbors, informing them of the militant racist in their area. 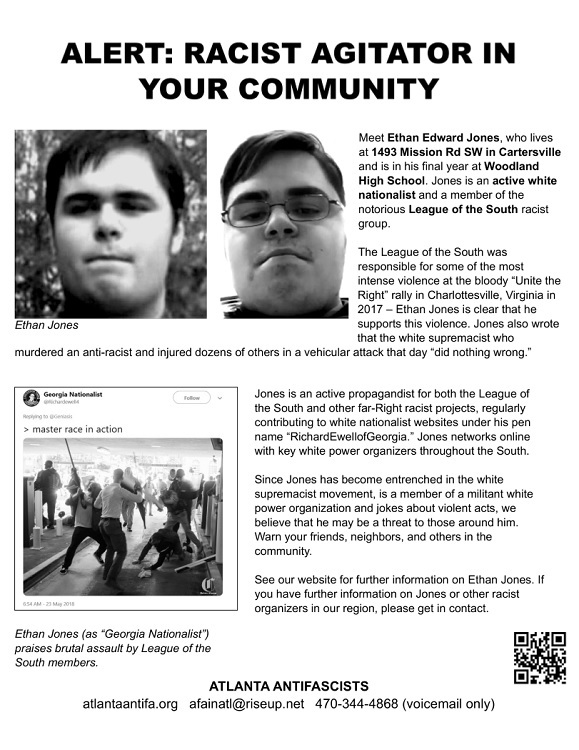 If you have further information on Ethan Jones, the League of the South, or other white nationalists in our region, please get in touch.